TD just published a new report which can be summarized as follows: If you just bough a condo with 5% down as an investment, you are screwed as housing is going to stay flat for the next ten years. Whether TD's report is accurate or not, and whether the Canadian housing market will stay flat, decline or grow is a completely different story. You can view the report here and below is my summary of it. - Even with present cool down in the real estate market, prices are still out of sync with the fundamentals such as price-to-income ratio, price-to-rent ratio and monthly affordability metrics. - TD expects a 2% annual home appreciation for the next decade. Beyond 2015 the annual real estate appreciation rate is forecast to be 3.5%. - From 1980 to 2012 the annual rate of house appreciation was 5.4%. The last decade had a 7% annual rate growth of housing prices. - The five year fixed mortgage rate is to rise to 7% in the long term, which is still below the 9.4% average between 1980 and 2012. 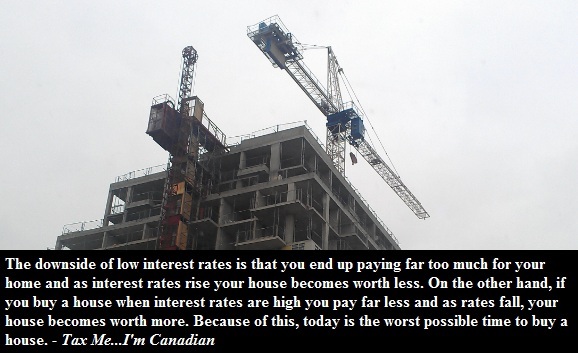 Just imagine what would a 7% mortgage rate would do to the housing prices in Canada. For one thing, RBC's housing (un)affordability index would skyrocket. Secondly, the prices would plunge. The good news is that it is very unlikely to happen in the near to medium term. So hey, if you are lucky, in five years you may still be able to refinance your five year fixed mortgage at 2.99% with guys from BMO. Yet that doesn't really mean that your house price will be worth as much as it is today. After all, TD expects 8% adjustment in the coming years but calls for the absence of a housing bubble in Canada. But listen - it really doesn't matter what type of adjustment BMO, IMF, Fitch, Carney or TD expect. It is almost certain that their forecasts are all off. If I were to make a forecast by how much condo prices will fall in 2013, I am absolutely sure that I will be wrong too. It is hard predict by how much, for how long and when the prices will fall. Now what really matters is what all those financial institutions publicly acknowledge, the fact that housing prices are currently out of whack. That's a clear sign to me that something is up. But you know that yourself. In fact most Canadians know that, just read the comments on housing articles on CBC or Globe and Mail. What this means if you are currently thinking of buying a property is that you must be extra careful. If you plan to buy a place with a major down payment and a 15% correction doesn't scare you then go ahead and call your real estate agent. Otherwise consider renting, as after all many apartments in Toronto are cheaper to rent than own as the Toronto condo bubble is past its peak.